Google recently unveiled a feature that consolidates their products even further. Now you will receive an email in your Gmail inbox if someone sends a message to your Google Plus account, even if they don't know your email address. Some people—perhaps most people—will not want it to be easier for strangers to send messages to their email inbox, even if the stranger won't find out their actual email address. Yet Google has chosen to make this setting opt-out rather than opt-in; in other words, "Anyone on Google+" can by default send you an email (though this setting does have a feature where you have to agree to receive more than one message from a person you don't know). To top it off, the only people who will automatically get an enhanced privacy setting are users with large follower bases, such as celebrities. Google Plus has for some time had a setting that lets you choose if you want others to be able to send you a personal private message. This feature, as potentially privacy invasive features should be, is completely opt-in. By default unchecked, users understood—whether they had seen the setting or not—that they would not be getting personal private messages using the service. They were given, and the norm became, a more secure mode of privacy. But now Google has opted them in automatically to this new, highly similar feature—which is addressed on a completely different settings page—reversing the type of privacy users had come to know. The old setting is by default ineffective. 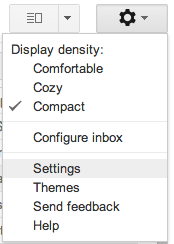 On the top right of your Gmail home screen, click on the button with a gear on it, then click on "Settings." This will take you to the General settings page. Scroll down till you find the "Email via Google+" setting, where it says "Who can email you via your Google+ profile?" There are four options: "Anyone on Google+," "Extended Circles," "Circles," and "No one." By default, the setting for most users is set to "Anyone on Google+." If you don't want to receive unwanted emails from others using your Google Plus account, we suggest changing this to "No one" or "Circles." But what about that other privacy setting? You may have noticed in your Google Plus settings that there was an option under "Profile" that says: "Allow people to send you a message from your profile" followed by a drop-down menu. For most people, this is unchecked by default; people could not normally send you private messages from your Google Plus page or by simply knowing your Google Plus account, which is usually tied to your name. Google, however, decided to make their new email feature—which, in essence, accomplishes the same thing—opt-out. Why would I not want personal private messages via Google Plus on one hand (the old setting) yet be totally okay with personal private emails via Google Plus on the other (the new setting)? This peculiar coupling of settings and expectations evokes Google's past encounters with privacy mishaps, most particularly the Google Buzz fiasco. While Google may continue the trend of integrating its products together, whether to provide a more seamless experience or to attempt to restore relevance to services like Google Plus, we hope Google will take a less confused stance on privacy in the future and allow its users to opt in rather than out.